Most meetings start with good intentions, but end with poor results. Ideas are discussed, decisions are made, but there is no clear plan of action. Fortunately, MeetingBooster makes managing meeting action items simple. By assigning and distributing meeting action items, sending reminders and tracking progress, MeetingBooster creates accountability and drives progress. Action items are what drive projects forward. But the creation, definition, and distribution of meeting action items can be a difficult process to streamline. With MeetingBooster, action items can be assigned during or after the meeting, and task owners are automatically notified. Overviewing projects is easy with MeetingBooster's Project System. 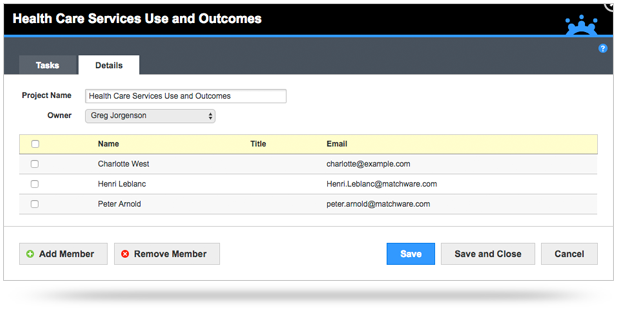 The system allows you to tag action items to belong to a group of related tasks. Setup your project, invite members and get instant project status reports! MeetingBooster simplifies meeting action item management, allowing organizations to focus on progress and productivity. By using MeetingBooster, task owners are notified by email when a task is assigned, and will receive reminders when tasks are pending or overdue. 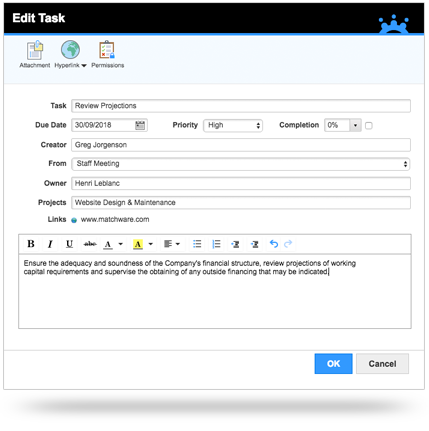 MeetingBooster's customizable action item reminder system increases employee accountability and relieves managers of the burden of continuously following up with action item owners. If your organization uses Microsoft Outlook, MeetingBooster's powerful Outlook plugin will synchronize meeting action items assigned during a MeetingBooster meeting with your Outlook task list, making it easy to manage all tasks from one location. 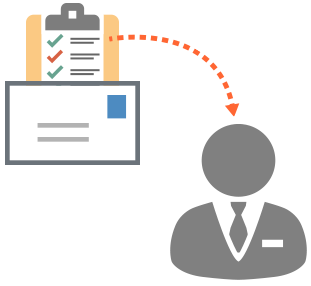 Click here to read more about Outlook Task List Synchronization. Updating task status should not be a complicated process. MeetingBooster's powerful task management system provides an efficient method for task owners to quickly update the status of their assigned meeting action items through their MeetingBooster My Task list, their synchronized Outlook Task list (Outlook plugin users only) or through the Project Label Task list. Status updates often present a challenge for managers. While many attempt to keep projects on track by following up via telephone, update meetings or by emails, these methods are time-consuming and inefficient. MeetingBooster lets managers monitor progress by allowing access to their subordinates task lists as well as though powerful Task Status Dashboards where they can view tasks by owner, project, division and more.